Many of these same problems and behaviors we discussed as a dad/coaching the team with their own child can also show up for any parent trying to coach their own kid at anytime. If you are spending quality time practicing with your kid, playing catch, doing extra batting practice and just talking about baseball stuff then you should make some clear boundaries before hand. Click here to read Part 1 on coaching your own child. Now, it is very good to play catch with your kid. It is also really good to help them by throwing batting practice and soft-toss to them or hitting them groundballs. It is much more likely your child will stay in baseball longer and build their skills better if you spend time practicing outside of the team arena. Look at how many professional ballplayers have children that in up playing in the major leagues. Why? Because they have some God given genes, but they also are around baseball playing and practicing in their own and with their dads. With your outside of the team practice, which is very necessary for successful baseball development, it is important to have parameters and boundaries. If you’re outside baseball practice is going to be enjoyable and a pleasure for you and your child you need to keep some things in mind. I was fortunate growing up to be a coach’s son. My dad was a football and baseball coach in high school and junior college. He was a real coach. I hung around him everywhere. I loved going to the school and shooting hoops in the gym and practicing baseball while he was at school. We often would go back to the school on weekends and he would throw my brother and I extra live batting practice on the ballfield. I loved it and couldn’t get enough of it. There is nothing I would have rather done than swing the bat having my dad throwing to us. The point here is this. My dad rarely if ever was guilty of coaching your own kid directly. He always kept a low profile. He just kept throwing BP and kept nice and quiet. He enjoyed the time by seeing us hit the ball well. If we didn’t hit the ball well he left it for us to figure out. He could have got all in our business and critiqued us when ever he wanted. But no, he stayed low key, in the weeds never over-coaching or over analyzing, or guilty of coaching your own kid. Therefore the relationship never became confrontational, hostile or combative. Bottom line' the batting practice events were enjoyable, pleasurable and without some adult know-it-all nagging at us after every swing. I provide a service for baseball families giving kids individual and small group lessons. This tells me that dad/coach could not just play catch with their kid. They had to add their .02 cents and commentary to everything. Dad's really want to help their kids by coaching them--but most of the time it will not be well received by the child. These dads’s could not just throw batting practice to their kid. They couldn’t just enjoy watching their kid. No, they had to try coaching your own kid, too. After all, every dad is an expert baseball coach and they are sure going to whip their kid into baseball shape by telling them to this and do that. This is why I say, “Never coach your own kid.” Never coach your own kid when it’s just one-on-one and you are practicing on your own. Never coach your own kid when it is a team environment. Never coach your own child. Enjoy them. Mostly they just want to hang out with their dad anyway. The last thing they want to do is to be corrected and critiqued (nagged at) every time you are together. Ignore them. If you are a dad/coach with your child on the team then you have to ignore them. You have to minimize the personal contact, conversations or coaching situations with you and your kid. Basically you have to let the other coaches coach your own kid. Your child is for the most part off-limits to you. When they are batting you have to be doing something else. You cannot be in the vicinity where you can say anything. Remove yourself from the temptation to coach them. When the action is elevated and things happen in a game or practice you likely will have to really bite your tongue at times. The gag-order is in place. You have to bite down and let one of the other coaches do the dealing. The same way dealing with umpires, pampering and making excuses. Often there is much you want to say and your natural instinct is to stick up for your kid and coddle them from being emotionally hurt. 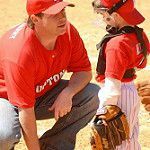 But for the health of your family and the team, the youth baseball experience will go much smoother if you can as much as possible ignore your child and let the other coaches interact with them when needed. I know a high school football coach that had their child on the team. He made a wise decision by having his child play offense while he coached the defense. That way he rarely if ever had any direct interaction with his child at the practice or games. The opportunity for coaching your own kid was minimized and therefore no opportunities for any combative confrontations ever surfaced. Make sure you get together with all the coaches and discuss ways and strategies to best deal with each of your kids. Communicate with each of the other coaches so you can eliminate much of the coaching duties that overlap into your own kids business. Common sense and reason come into play too. Obviously you have to interact with your child at times. For the most part you are better off ignoring them as far as conversation and instruction go. Challenge: Ignore and Enjoy! I encourage you to try it.